There is much discussion these days about food and health, and the often complicated relationship between the two. When I entered the school of public health two years ago it was my mission to have that conversation from a different perspective. I believed then, and believe even more strongly now that very little about our health can change without a few basic skills. These skills are the skills of knowing where to find healthy food and how to prepare it. That’s right, I believe with all of my soul that cooking is a public health strategy! Cooking used to be something that was passed down from generation to generation, family rituals and cultural traditions along with it. These days it is a disappearing art, falling to the wayside along with things like handwritten letters. The once common experience of sharing in the preparation of the meal, and in the nourishing of others is now a rare one. One thing I know for sure is that our most recent attempts at nutrition education-the food guide pyramid and 5 a day programs haven’t really worked. While it is interesting and useful (somewhat) to know that kale is rich in calcium and vitamin A, and that strawberries are full of vitamin C, what is more important is knowing that kale stir fried in toasted sesame oil and ginger is delicious, and that strawberries and honey mixed with oatmeal are a fantastic breakfast treat. Only 1 out of 5 children in the country is eating the recommended fruits and vegetables per day. Something has to change. 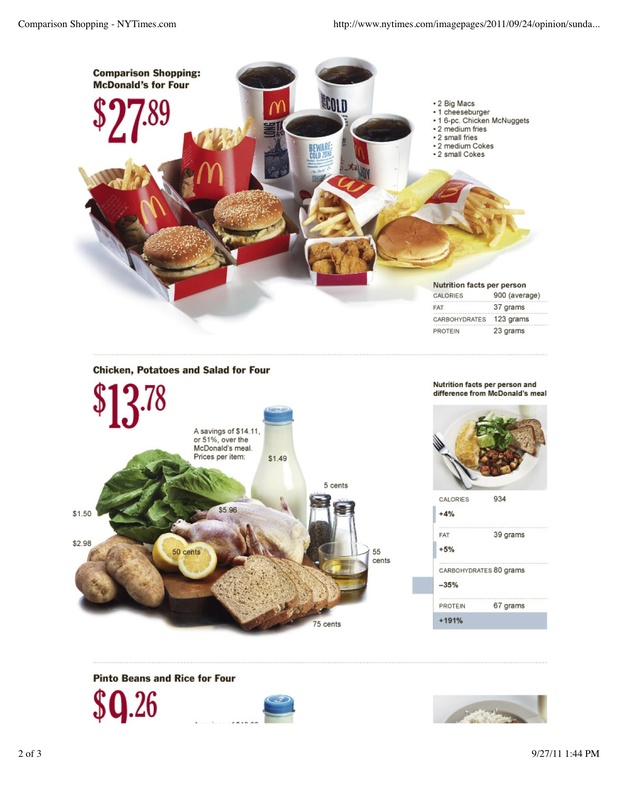 I have written a lot about the claim that healthy food is more expensive and that it takes time that people don’t have. Meanwhile, the average American is watching up to 4 hours of television per day, and more and more it is clear that good, whole food can be bought and prepared for less than a typical fast food meal. It is simply a matter of commitment. He also highlights issues of access to healthy foods, and the strong link between low income communities and higher rates of obesity. He describes some exciting projects throughout the country that are addressing some of these problems as well as acknowledging the large amount of work still ahead. Ultimately, Bittman shows what many of us already know-that eating good real, whole food is not only nourishing and life sustaining, but it is affordable too. I believe with all my heart, and it is the central theme of my cookbook: if we focus on the joy of good health and good food shared with one another we will all come out ahead. Our food system is complicated when it should be simple, and unhealthy when it should be nourishing us all. I am commited to working to get families, neighbors, schools and communities back into the kitchen to share the joy and the benefits of sharing a simple meal prepared with love.